Sometimes you don't really have a specific meal in mind for dinner but you know you have food in the fridge. A bit of a red pepper, half a bag of spinach, cheese - that kind of thing. You just have to use your ingenuity to come up with something. A frittata, which is like an open-faced skillet omelette, works wonders for using up odds and ends and makes an elegant dinner. I read somewhere, I think it was in a Pam Anderson book, that you can have an omelette for breakfast with OJ, but a frittata you can have in the evening with a glass of white wine. I like omelettes for dinner too, but I wouldn't think of drinking wine with one. But with a frittata, I could see it; it is almost like a crustless quiche. And it has italian roots, so a wine pairing is natural. 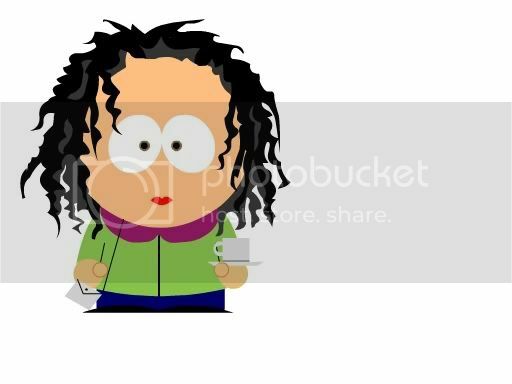 I found, when looking up recipes, that most call for 8 to 10 eggs. A dinner for 4 in a large skillet. I needed a mini frittata. Googling gave me this recipe for Frittata for two, but I've got to admit that I only used proportions here and I didn't follow the exact cooking instructions. I did end up running it under the broiler but for far less than 2 minutes. When it is golden brown underneath and set all the way through, you can run it under the broiler to brown up the top. Then cut it in wedges and serve. 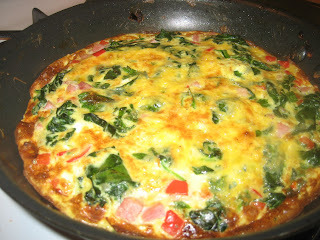 My frittata included spinach, red bell pepper, onion, a small amount of ham, and cheddar cheese. But there is an infinite amount of combinations you could do. I was tempted to add asparagus, but I decided to use that on a side salad with blood oranges. Curiously, citrus and asparagus go good together. This was a really tasty, healthy dinner. 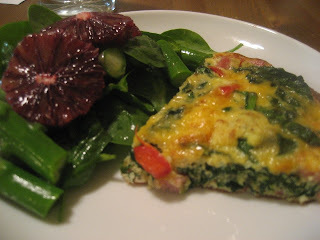 By the way, the frittata doesn't have to be hot, it can be served room temp too. The taste of the different veggies comes through more when it is not super hot. Toni, I was having a dilemma about dinner. I have great produce, but I had no meat or fish in the house. I wanted a healthy meal and remembered that my neighbor had brought me a dozen eggs this morning (she is going out of town)and that you had recently posted the frittata recipe. I am gonna try it...I already made a simple salad with roasted flax seeds and a light vin......perhaps John will have wine. I'll let you know how it turned out...I am sure it is gonna be scrumptuous. Eggs, cheese, veggies - sounds like a good meal to me.